This is a patronymic i.e. "son of Ade", a pet form of the personal name Adam, frequently recorded in the Domesday Book and deriving from the Hebrew for "red" - possibly referring to the earth from which God formed the first man. The surname from this source is first recorded in the early half of the 14th Century, (see below). One, Nicholas filius (son of) Ade appears in the 1379 "Poll Tax Records of Yorkshire" and a Willelmus Ad(d)es is entered in the same records. The final "s" added to a name indicates the English patronymic and is a reduced form of "son of ". The full patronymic Adeson also apears in these records. The name is well recorded in Surrey Church Registers under the variant spellings Adis (1665), Addess (1669) and Addis (1785). 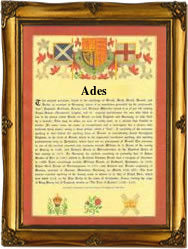 On June 16th 1797 one, Robert Ades married an Ann Marie Jane Niblett in Dorking. The first recorded spelling of the family name is shown to be that of Thomas Ade, which was dated 1327 in the Subsidy Rolls of Sussex, during the reign of King Edward 111, known as the Father of the Navy, 1327 - 1377. Surnames became necessary when governments introduced personal taxation. In England this was known as Poll Tax. Throughout the centuries, surnames in every country have continued to "develop" often leading to astonishing variants of the original spelling.